Many cities around the world have their own versions of the CN Tower. Seattle has the graceful Space Needle, Calgary has the creatively-named Calgary Tower, Rotterdam has the squat Euromast, and even Niagara Falls has the Skylon. 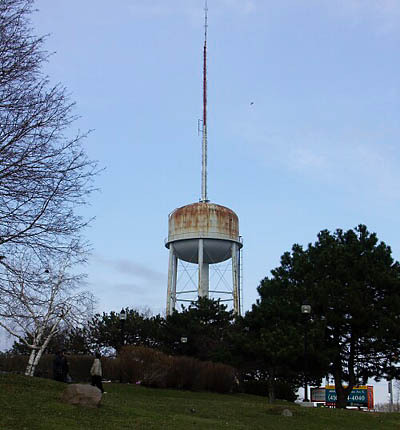 Yet despite the best efforts of all of the imitators, several of which are such fierce competitors that they copied our own CN Tower years before it was even conceived, none of them are quite as towery as the original. It’s not quite as grand as the others and it lacks a revolving restaurant, but it makes up for those shortcomings with a healthy coating of rust and a certain suburban je ne sais quois. I frequently see antennae of various descriptions perched atop water towers, but this is by far the largest such specimen that I’ve encountered.